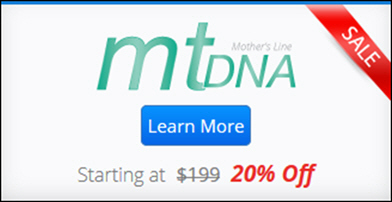 There’s a sale going on right now at Family Tree DNA on mitochondrial DNA (mtDNA) tests. Until midnight central time tomorrow night — Monday, August 31 — you can get 20 percent off on mtDNA tests through Family Tree DNA. This is not a test to do if all you’re thinking about is finding new cousins to compare your family history with or what your possible athnic origins might be. That would be one of the autosomal DNA tests, like Family Finder from FTDNA or the test from AncestryDNA or 23andMe. And this is not a test to do if what you’re thinking about is tracing your surname — your father’s father’s father’s line. That would be the YDNA test from Family Tree DNA. But if you have a specific family mystery on the maternal side of your family, this is a test that can put it to rest for once and for all. It’s a test that looks deep into your mother’s mother’s mother’s side of your family tree.1 And despite the fact that it’s a bit of a pricy test — the full mitochondrial sequence will be $159.20 even after the discount is applied — it’s worth its weight in gold if mtDNA can answer that question for you. Another way you can use mtDNA is to determine which of two wives you may descend from if you know a particular ancestor was married more than once and you’re not sure which wife is in your line. Since all of the direct maternal line descendants will have the mtDNA of the wife they descend from, then as long as you can find candidates to test in that direct maternal line (the son or daughter of a daughter of a daughter of a daughter, for example), you can slot yourself into the right wife’s family. So if you have a family history mystery that can be solved by mtDNA, now is the time to act. Go get those tests done — and save 20% in the process. Just place your order and pay before 11:59 PM Central Time August 31, 2015. I have had little time to expand my knowledge base in the last few years. This was a great article for someone like me, who knows very little about DNA tests. Your explanation the mtDNA test is accurate, Judy, although I think you beat around the bush a bit. Simply put, the mtDNA test is a total waste of money for most people. Your examples of when the mtDNA test is valuable clearly demonstrate the limitations to what can be learned from it for genealogical purposes. Unless there is a very specific question to be resolved, it is an expensive trinket in the jewelry box. And I say that as one for whom it has been somewhat useful in that it confirmed my maternal side’s paper trail back to 16th century England (specifically, I had one match that had traced their line back to a sister of one of my ancestors – two entirely different female lines coming together on paper and with DNA in one female common ancestor). Was that confirmation worth the $169 I paid in a previous sale? Perhaps, but others might well think differently. I couldn’t disagree more. It’s a test to do whenever there’s a question it can solve. If it can’t solve the question, then of course it’s a waste. But if it can, there’s no more powerful tool in the DNA toolbox. I think you pretty much said the same thing – my point was exactly that you must have a specific question you are trying to answer and the question must be answerable by the results of that test. If you have such a question the mtDNA test is invaluable; if not, it is just of passing interest and a way to spend money. The other tests, both autosomal and Y-dna, are much more likely raise their own questions whether it be “whose your daddy,” “whose your second cousin once removed,” or that catch-all, “what’s my ethnicity?” But of course, if they can build a reasonably robust client database for mtDNA it may prove more helpful in the future and since I’ve already partaken of it, I am happy to see others do so as well.